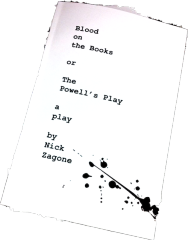 Blood on the Books or the Powell’s Play relates behind-the-stacks melodramas at Portland’s fabled City of Books where vampires with e-reading talents have begun reside and reproduce. At Powell’s, no one can hear you scream… No really, they can’t, it’s too big. Nick Zagone is an award-winning playwright who was born and raised in Portland, Oregon. His plays have been produced in nine foreign countries, over thirty US States, over fifty colleges and universities, and translated into five foreign languages. He has a BA in theatre from Willamette University and an MFA in playwriting from University of Nevada-Las Vegas. Nick is also a founding member of Open Circle Theatre in Seattle, Washington. His plays include David and Goliath in America: A William Kunstler Story (Mark A. Klein Playwriting Award, Artistic Director’s Achievement Award by the San Fernando Valley Theatre League Alliance, Los Angeles Ovation Award Nomination), Driving Under the Influence (Fulton Opera House Award, JAW Festival Reading Selection, Mark Cohen Playwriting Award Nomination), Howard’s Hand (New York MultiStages Festival) Ohio (Northwest Playwright’s Series Finalist), ETA: Phoenix (a Seattle Times Footlight Award), Our LA Man from Vegas (Prospect Theatre Playwriting Competition Winner), American Dodo (Northwest Playwright’s Series Finalist) and Brainstorm (winner of the Lamia Ink! International One-Page Play Competition in New York). Nick’s screenwriting credits include a short film of Brainstorm and the feature Ricky is Famous. Nick has been recognized by the American College Theatre Festival, the Association of Theatre in Higher Education, and the Seattle Schools Interagency Arts. Nick’s commissions include the Sierra Repertory Theatre in Sonora, Iron Ring Theatre in Turlock, and Prospect Theatre in Modesto, CA. 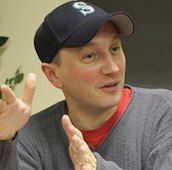 His work has been published by Dramatic Publishing and Black Box Press. Nick currently teaches at University of Portland and lives in Portland with his wife and son. Test pattern. Test pattern. Test pattern. Nobody wants to be at this meeting. This Meeting. They only want to be at this meeting because maybe it will go to long and they will miss the meeting after this meeting which is much worse than this meeting but still…they’ll take a meeting over cashiering, which maybe if this meeting goes long enough I’ll miss my shift of cashiering. Hm. …and she’s a lesbian. The manager. And she’s nodding and talking…and I think how cool it is to be a lesbian leading a meeting with other men and women and nodding while having a fauxhawk, and Dad Jeans, and cool frames, and man it’s cool to be lesbian. And I nod as I think of that, and someone nods back at me inadvertently nodding, and the manager talking starts nodding making sure everyone else is nodding, and if they’re not nodding? She nods at them and reiterates the point until they nod back. And I do.